proto-col Informed Sport Registered green magic powder 200g. proto-col green magic powder has been Informed Sport tested (please see their website). The World Health Organization and the NHS recommends that you take 5 portions of fruit and vegetables a day. Fruit and vegetables are part of a balanced diet and can help us stay healthy, that’s why it so important that we get enough of them. With today’s hectic lifestyles and convenient fast food many people find that they are not able to achieve this recommended standard – and this is where proto-col green magic comes in. 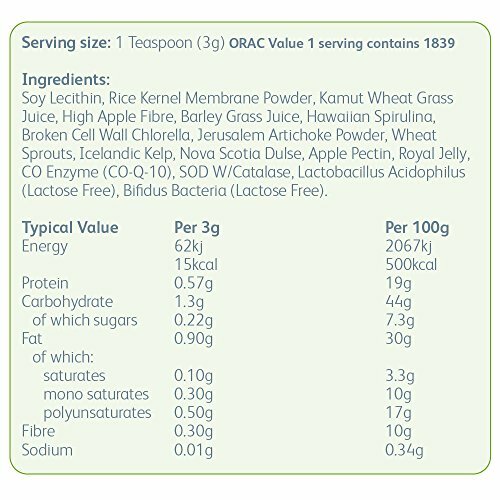 One serving (3gm) of green magic delivers approximately the same food value as 7 helpings of organically grown fresh fruit or vegetables but with just 15 calories. Green magic is a revolutionary product that blends 16 of the world’s most effective and nutritious superfoods into one convenient serving. Available in both powder and capsule form – green magic is an easy and convenient way of getting your 7 a day in a single dose. Green magic is an excellent source of vitamins and minerals, including folate, vitamin C and potassium. It is also an excellent source of dietary fibre, which helps maintain a healthy gut and prevent constipation and other digestion problems. Green magic contains two of the highest sources of protein, traps cholesterol and helps remove it from the body. Green magic has clinically proven results Green magic has been scientifically tested and clinically proven to improve cardiovascular health and lower biological age. Clinical studies show the key ingredients used in green magic helped lower the body’s biological cellular age by an incredible 13.5 years, when participants took just one 3 gram serving daily for three consecutive months. Scientists attributed this anti-ageing effect to the mix of energy-boosting enzymes and edible green algae including Superoxide Dismutase (SOD), Glutathione Peroxidase, Catalase, Spirulina and Chlorella. Rich source of anti-oxidants and and amino acids. Good brain fuel – excellent for memory and nerve function. Emulsifies fats and oils into water. Good source of potassium and calcium.